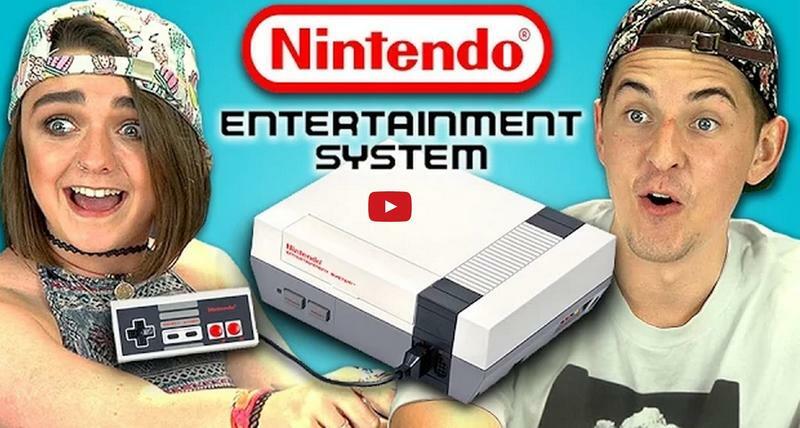 Most will tell you that this "Teen's React" video will make you feel old, but I'd like to stop for a different angle and take a minute to appreciate these teen's reactions to the NES. The series has never left me with the most positive feelings for kids and teenagers who can't appreciate anything older than their generation, but all that comes to a crashing halt when they get a hold of the revolutionary Nintendo Entertainment System. Granted, not every teen reacts positively to the classic gaming console. "Are you going to tell me that this is better than an Xbox One in 1080p?" Yes, I am going to tell you that. However, despite teasing its blocky design and not even knowing how to blow into games to turn them on correctly, most of their faces light up at the chance of playing Super Mario Bros. In fact, a majority conclude that while they still prefer the video games of today, they can also still appreciate that it has its place in history and has vintage appeal. You'd even be considered "hip" among your friends for having one. Game of Thrones star Maisie Williams even says that it's a shame the kids of today didn't get a chance to play it during the peak of its popularity. Alas, so true, so true. At least there is always Virtual Console on the Nintendo 3DS and Wii U. You really have to wonder how authentic of an experience you are getting though when Nintendo releases games with a built in filter control, and you don't have to suffer through the stream of duds we had to. So, time! You have met your match! The NES is an immortal machine that even the forward thinking youths of today can still appreciate. Oh Nintendo… why you gotta make me feel so good?